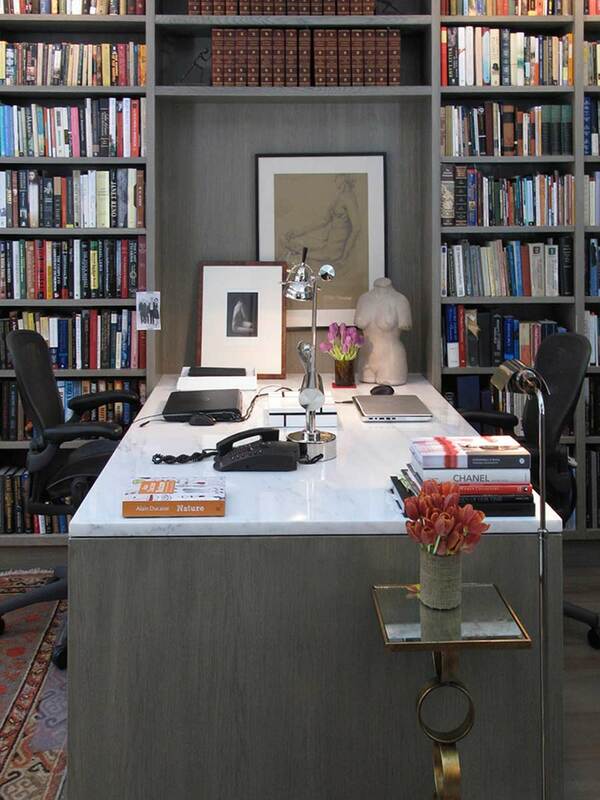 Creating an environment that encourages you to be organized and productive, takes intelligent planning and expertise. Everything from the lighting, to how much desk space is required around you, matters for making that perfectly ergonomic space. An office should have deeply personal touches, optimized for how you work; this means making desks, shelves, and drawers just the right size for your things, hiding printers, wires, or routers, and hiding TVs or screens. This was part of a whole apartment gut renovation in preparation for a couple to relocate to Park Ave. They wanted a substantial home office and library, with a custom desk big enough for two people, as well as built-in shelving. Two people could work at this desk while facing each other, and each had their own space and drawers. 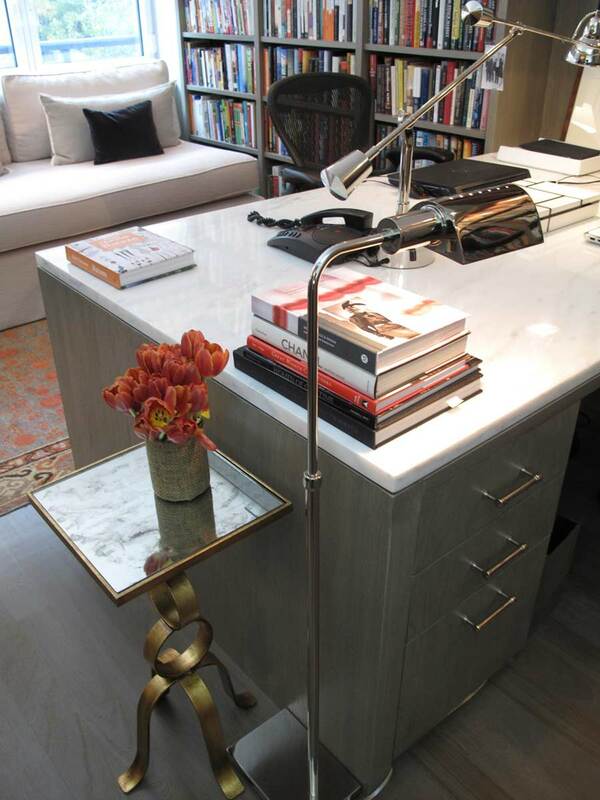 The desk had a custom-cut marble top, which tucked into a recess in the wall. Light sconces illuminated the shelves above. Everything was made of stained white oak. This retired couple had the bottom two floors of a classic townhouse. The husband had grown up in NYC and lived on the West Coast for a long time before returning to New York. 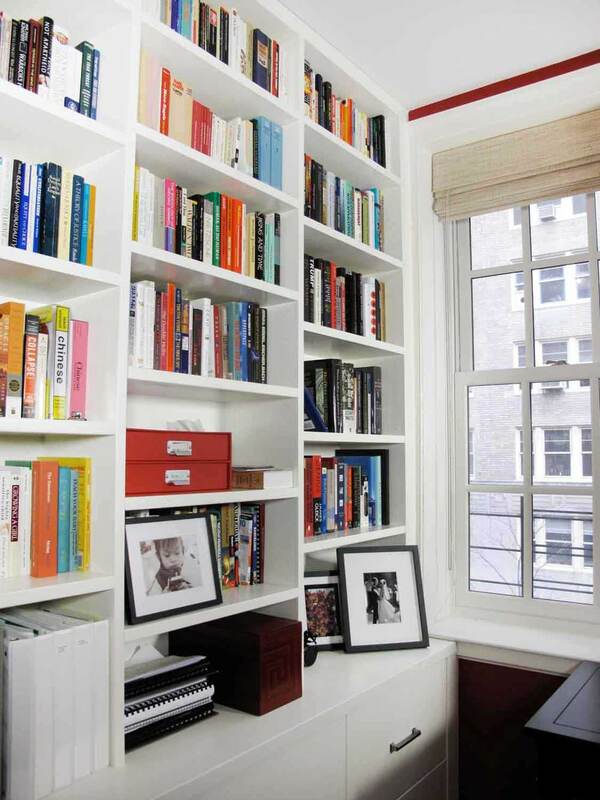 They wanted built-in bookshelves in the living room and hallways for their extensive book collection, but the most interesting part of the project was what to do with the best room in the house: a strange trapezoidal room that defied typical design solutions. This unusual trapezoidal room had a view of the backyard, and the wife of the couple saw the possibility for this funky space. Since she had also had her heart set on an office, we decided to carve out her office here. We built an L-shaped desk with deep drawers, and plenty of elbow room that turned the corner. It had a glass top to keep the finished wood surface of the desk pristine. The column next to the desk was for the printer and some books. It was built to follow the underside of a staircase (the top had an angled cutaway). This family of four had the whole house to themselves on a quiet street of the West Village, and wanted a corner office with plenty of file storage. The floor was extremely sloped (as is the case for many spaces with rustic charm), but bases were placed underneath the built-ins to provide a level surface. 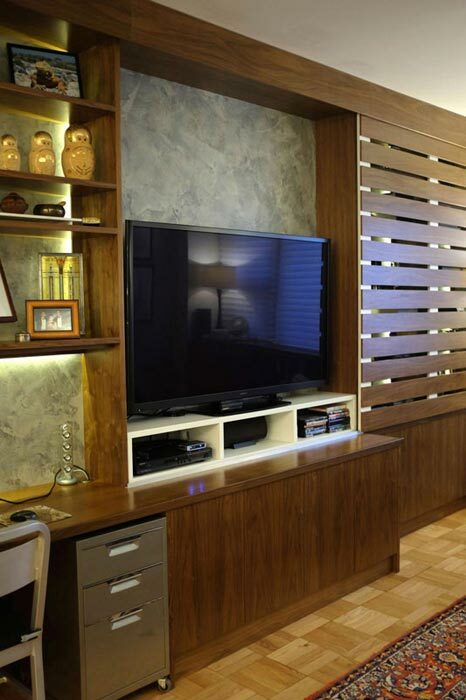 This client wanted to hide the TV with a wooden sliding panel with slats; a modern take on the sliding barn door. He opted for a faux finish to match the opposite wall, and indirect concealed illumination. Everything was made of walnut. We also incorporated his existing file drawer, and concealed the large printer, but had it on a slide-out tray for easy access. As part of a gut renovation for this apartment, this couple wanted a storage/display unit for an alcove area next to their kitchen. They also wanted a comfortable desk area next to their view of the Manhattan skyline. See design inspirations for nook offices.